Today I received my first alert (see screenshot below) since subscribing to Experian's credit-monitoring service about 4 weeks ago. While I appreciate the heads up, the user experience is not at all what I want. 1. Cries wolf. All the alert tells me is that there was a "key change" posted to my file. Is it a routine credit inquiry (which I was expecting) or did someone just open an account at Best Buy in my name? The only way to find out is to log in to my FreeCreditReport account, which took three minutes since I couldn't remember the username/password. Please provide more info in the alert so I can better gauge the severity of the situation. 2. Not phish proof: While Experian does use my first and last name in the salutation, thereby improving believability, additional personalization is needed to help users know it's genuine, especially when the company's log-in process requires input of a social security number confirmation after login. 3. Not enough trust: I've worked with Experian for more than a decade so I know and trust them. However, the average Joe/Jo doesn't really know whether FreeCreditReport is a trustworthy company or not. 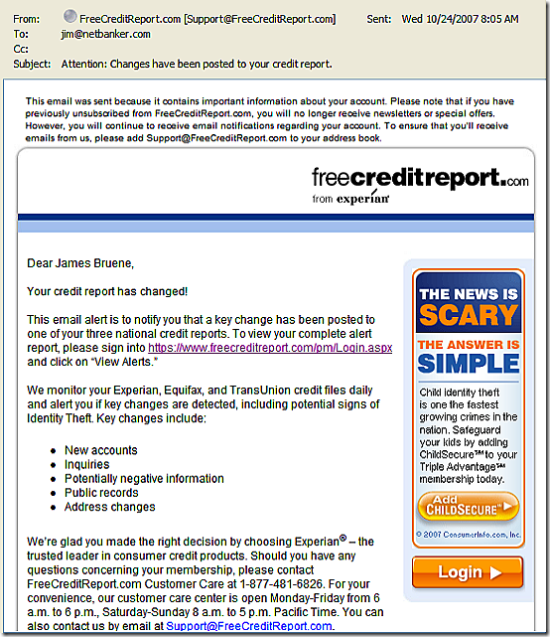 Credit monitoring alerts are too easy to miss if they don't come from a recognizable and trusted name. It would be much better if they came from the user's financial institution or card issuer, someone with whom they do business on a monthly basis, so the emails don't end up in some spam filter. 4. Not integrated with online banking: I really don't want to remember yet another username and password, nor do I want to spend five minutes of my day logging into another website to verify there are no criminals using my credit files. Credit monitoring and credit scores should be integrated into online banking so I can keep track while doing my normal banking. 5. Doesn't tell me what to do: In this particular case, I knew about the inquiry, but what if I didn't recognize it. The website doesn't provide any info on what to do if I did not authorize the inquiry, which could be the first sign of serious identity takeover (see screenshot below). For more information, see our recent Online Banking Report on Credit Monitoring Services here. Two weeks ago, Motorola Inc. introduced the same mobile payments platform already being used in Japan and India, opening the door for U.S. banks on a retail payments future that could spell prosperity or doom, depending on the choices they make. Those loaded alternatives have little to do with the immediate future for mobile payments in this country. Buying cheeseburgers by waving a cell phone will begin as a gee-whiz novelty in this country, packaged in ways that will preserve the bank brand, and allay the current boardroom anxiety that banks are fated to become mere payments utilities. The real danger to banks is the next generation of m-payments, when the payments chip is miniaturized to fit into a ring or necklace; at that point, opportunities to remind customers of which bank’s card they’re using will disappear, along with the visible screen, taking with them much of the bank’s relationship with its customers. But this generation is here now, says Dan Schatt, a Celent Communications analyst, and likely to shake things up.